Below is information on ways to purchase tickets for the 2018 OVC Men’s and Women’s Basketball Championships at the Ford Center in Evansville, Indiana. For more information on the event, visit the OVC Basketball Championships Website. The Ohio Valley Conference Men’s and Women’s Basketball Championships presented by VisitMyrtleBeach.com, will be held February 28 through March 3 at the Ford Center in Evansville, Indiana. It marks the first time the event has been held at the Ford Center. The Ford Center, which opened in 2011, is a 11,000-seat arena located in the core of Evansville’s downtown district. Tickets for all women’s games of the tournament are general admission. Tickets for the men’s games are reserved tickets. CLICK HERE for an image of the Ford Center seating chart. All-session tickets can be purchased through School Ticket Offices and online through the Ford Center. The cost of all-session tickets is $60 through February 1. The price increases to $80 on February 2. Team sections will be assigned to the four teams participating in each men’s session. Each of the four Team Sections has 250 seats. 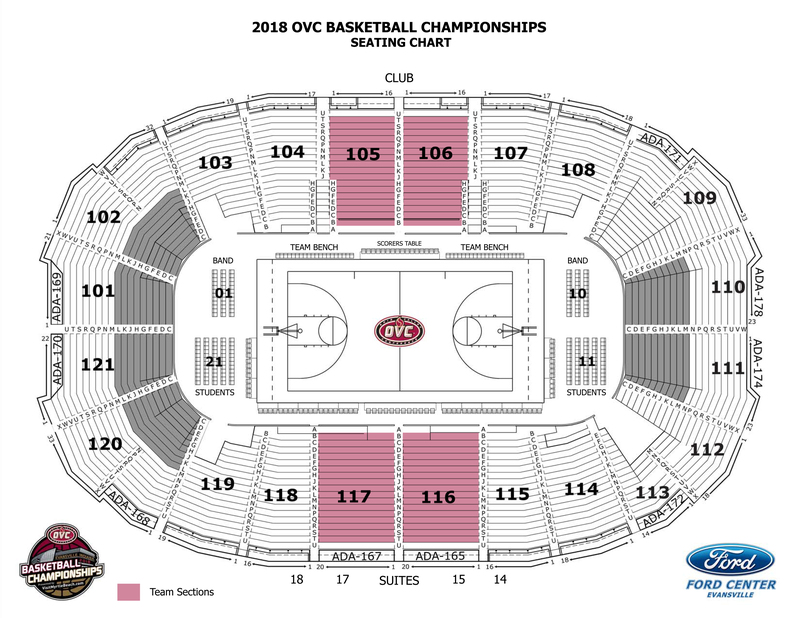 The first 250 fans to purchase an all-session ticket through an OVC member institution box office will have a reserved seat in one of the four (4) floor Team Sections during the session in which the team printed on the ticket in participating. After the first 250 tickets are sold, any tickets sold by the institutions will be located in a reserved seating area designated by the OVC. Ticketholders with tickets in the Team Section will have a reserved seat for sessions in which the team printed on their ticket is participating in. If the team printed on the ticket is not participating in the session, fans may sit in sections 101, 102, 120 or 121. Single-session tickets to the men’s and women’s basketball championship will be made available through the Ford Center box office and online at Ticketmaster.com. Single-session tickets will go on sale to the general public on Thursday, February 8, 2018. Single-session tickets are $30 per session for men’s games and $15 per session for women’s games. The cost for children 12 and under is $10 for men’s sessions and $5 for women’s sessions. There are several single-game promotions that are only available directly in-person through the Ford Center Box Office. A complete link of sessions and game times can be found on our Championships Information Page. The OVC uses the Ford Center policy regarding tickets for young children. Children under 2 years of age may enter the Ford Center free of charge, providing that he/she sits on the lap of a parent or guardian. Children 2 and older must have a ticket to enter the Ford Center. The Ford Center offers accessible seating in an integrated setting on all levels of the building. Accessible seating on the floor is subject to change depending on seating configurations for various events. Seats are sold with one companion seat. Exceptions may be granted through the Ford Center ticket office, space permitting. This seating allows the disabled guests an enhanced view, even when others are standing. In addition to wheelchair locations, modified aisle seats are also available. For more information, please contact a Ford Center box office representative with any concerns or questions or visit the Ford Center’s Accessibility Services Guide.